Get Gems of Fire for $0.99 March 27-April 3! 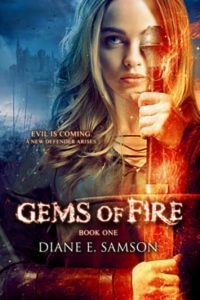 Diane E. Samson is the author of Gems of Fire. She was lucky enough to grow up on acreage just north of Kansas City, Missouri, with horses and dogs in the backyard. When she wasn’t dreaming of Narnia, she was outside riding her horse, training her dog or spending time swimming at the lake. Her love of words led her to earn a degree in magazine journalism from the University of Missouri-Columbia. She subsequently worked as a reporter, editor and in public relations. After moving around the country, she has returned to the Kansas City area where she lives with her husband, children and dog. She will never be without a golden retriever. Please reach out at dianesamsonauthor@gmail.com.